A few weeks ago a video montage of mainstream media coverage of UFO sightings did the rounds on the internets. Cut, chop, add in some intense music, and this is what you get. I really don’t understand these videos. Or rather, I don’t understand the masses that get swept away by videos like this. Decades ago, a blurry photograph or video was enough to cause a stir but in today’s age of Photoshop and Hollywood I don’t see how either hold any credence. Decades ago, a claim of something large and not immediately identified in the sky was perhaps cause for alarm but in today’s age of Predator drones and satellites do these objects really cause the mind to wander? Upon first seeing this video I knew at least a couple of the featured events were already explained but that scoff was the extent of my lazy protest. However, a coworker of mine took the time to debunk much of it and I felt he did such a great job that I wanted to repost it here. Firstly, try not to let the spooky music impair your judgement! I’ll examine the first seven “sightings” in the video (I gave up after that because it then launches into a frenzied montage with few specifics), and augment them with my findings and those of other people. I’ll deal with them out-of-order because some are debunked with almost no effort. 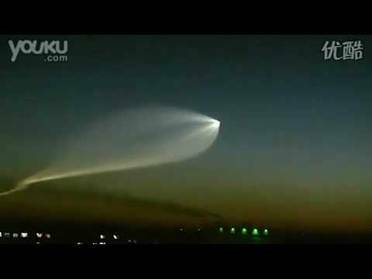 It certainly had the two newscasters bamboozled (unsurprisingly, seeing as it was Fox news), but anybody who has lived in the Los Angeles area for a few years should be able to identify immediately it as a satellite launch or a missile launch. As the launch vehicle moves into the upper atmosphere, the tenuous air presents little resistance and the exhaust plume spreads out to enormous size. With the time of day just right, it can be night on the ground but the plume is high enough to catch sunlight and appear very bright. It’s hardly surprising that paranoia was running high at that time, as the sighting occurred only about a week after another high-profile one in China, examined further below. For me, this one set the tone for the rest of the video – the person who put it together is either extremely naive, or being intentionally deceitful. 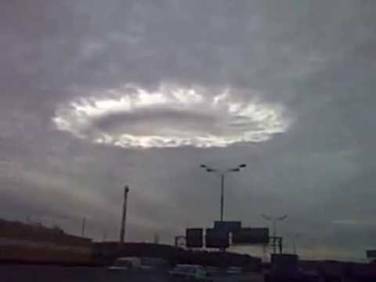 Though spectacular, it’s just an uncommon type of cloud formation. Try an image search ‘fallstreak holes’ or ‘hole punch clouds’. Perhaps revealingly, the immediately preceding footage of a news presenter describing it has been edited so that it sounds a lot like she says “and scientists / left baffled by…”, where ‘/’ represents the moment of the edit, as can be clearly seen by watching the news ticker jump to a completely different sentence. 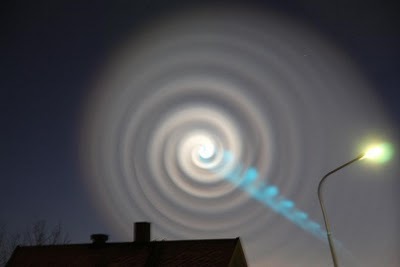 But this effect was really observed, and the cause was quite quickly discovered to be a failed Russian Bulava missile. The third stage of the rocket malfunctioned and began to spin, spewing its exhaust plume like a Catherine wheel. 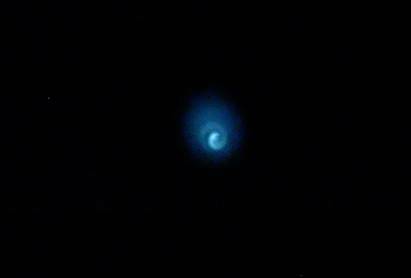 As with the China sighting, the upper atmosphere presents almost no drag and allows the plume to expand to a gigantic size, and the plume catches sunlight at high altitudes while it’s nighttime on the ground. The first thing which struck me was that the pictures didn’t appear to match the description. 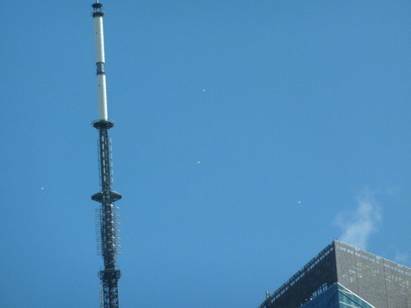 Why weren’t we told something like “residents captured stunning close-up photos of airborne craft flying near Xiaoshan airport”? The pictures also appeared to me to have been taken in very different locations from one another, which at least hints that something might be awry. A bit of investigation reveals the answer. The consensus seems to be that this photo quite possibly was taken in or near Xiaoshan on the given night. 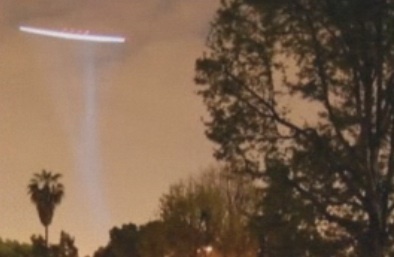 However, close examination suggests that it’s just a plane photographed with a long exposure. 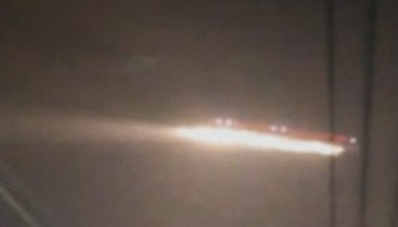 The plane is moving from right to left, with landing lights on, leaving a bright white streak while the camera shutter stays open. 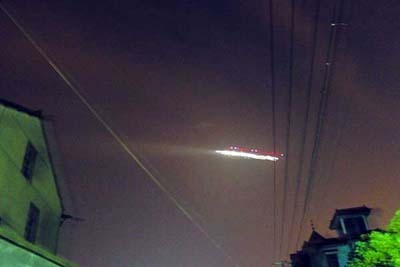 The beam of the landing lights is visible to the left. The port wing-tip has a red light which leaves the upper red streak. Visible in that streak are bright spots which are the strobing lights on the wing-tip – you can see matching points on a fainter streak at the bottom, which is presumably the right wing-tip. 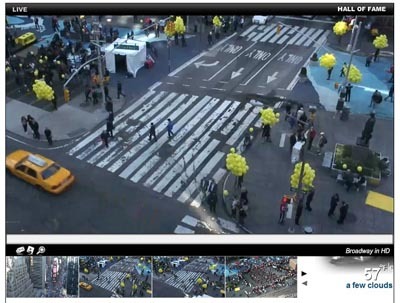 Armed with this new perspective on one of the photos, more information emerges on the others. 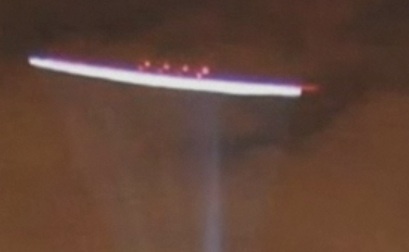 They are long exposure photos of helicopters which somebody presumably dug up from the internet, and they have nothing to do with the Xiaoshan incident. If you look at one of the posts some way down the following page: http://www.abovetopsecret.com/forum/thread558335/pg1, you’ll see that it contains images 2(a/b) and 4, with the description “pictures of helicopter as an example (all I had in my MATS folder)”. But, crucially, the posting was made on April 4th 2010, 3 months before the Xiaoshan incident. The red lights on the top of the object in 2(a/b) are again strobing lights captured by the long exposure. This is the original source of image 4. Note that it was taken in a different continent, 3 years before the alleged sighting. But in image 2a, for example, how does the beam get focused like that? The helicopter is circling something. As the beam points towards it, the long exposure creates a cone of directions. 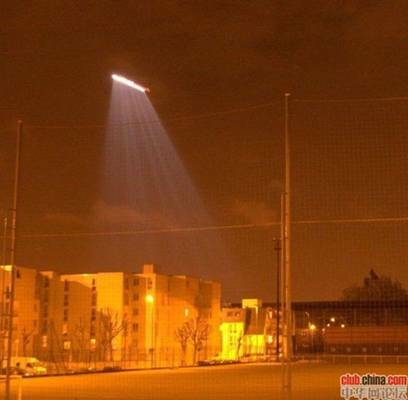 We’ve all seen this happening with police helicopters in California. (Indeed I can’t help thinking that the pine tree in 2a might be in California.) Shame on ABC News for jumping on the sensationalist bandwagon. Unfortunately I think this type of thing is typical of much of today’s mainstream news. 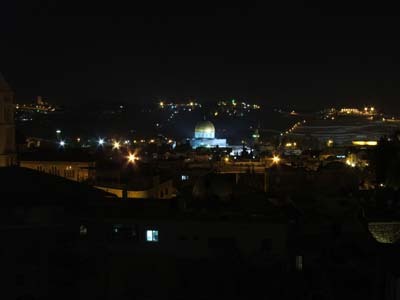 We see parts of 4 videos which allegedly show, from 4 different view points, an object hovering above the Dome of the Rock in Jerusalem’s old city, which then appears to swoop down to a spot just above the dome. It remains there for a while, after which there are some flashes and the object shoots skyward, leaving a pattern of dancing red lights in the sky. So am I actually interested in ‘flying saucers’? Yes, I find them fascinating – but as a purely social phenomenon. There has never been a single piece of scientifically substantiated evidence in support of the notion that we’re being or have ever been visited by aliens. 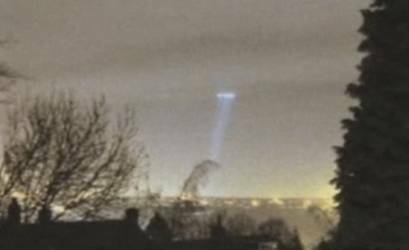 Give me any piece of video footage, and before I even look at it, I’ll bet you a thousand dollars that it’s not a video of an alien spacecraft. If you really are interested in the possibility of extraterrestrial life, you’d be much better off investing your time in keeping abreast of the real scientific work behind missions to other bodies in our solar system, the SETI program, and the recent technological advancements in the hunt for exoplanets which have led to a genuinely exciting explosion of discoveries. I’m very passionate about that science. But I’m even more passionate about the alarmingly dumbed-down state of the population at large. I’m not singling out the US here – the same criticism can be leveled against many technologically advanced nations where society ought to be better equipped. ‘UFOs’ represent just the tip of the iceberg – astrology, ESP, telepathy and other psychic abilities, the paranormal, ghosts, reincarnation, out-of-body experiences, fortune telling, homeopathy, Holocaust denial, alien abduction, crop circles, a young Earth, the list goes on. Widespread credulity, lack of scientific literacy, and lack of critical thinking and analytic capabilities seem to be the norm today, leading to the ease with which we buy into unfounded beliefs, with total disregard for presence or lack of evidence, and ultimately leading to untold damage and suffering. It turns out that many people would rather jump to conclusions for dramatic effect. Big surprise. It is ok to be in wonder of these phenomena because we live in an interesting natural world. Making up stories, however, cheapens them. Do people at large not realize that as a population we’ve sent many craft into the sky and space? Why would the first thought upon seeing one be that it was built by a life form other than ours? It is quite overdone to point out that the simplest answer is the most likely, but what is sometimes lost is the true wisdom behind those words.